Companies primarily engaged in performing a variety of shrub and tree services make up the ornamental shrub and tree services industry. Activities common to this industry include ornamental bush and tree planting, pruning, bracing, spraying, removal, and surgery. Tree trimming around utility lines also constitutes a significant share of industry revenues. Companies that perform lawn and garden installation and maintenance are described in SIC 0782: Lawn and Garden Services, and companies offering shrub and tree services for farm crops are included in SIC 0721: Crop Planting, Cultivating, and Protecting. The ornamental shrub and tree industry consists mainly of small, family-owned businesses; most companies offer the service in addition to lawn care and maintenance. Working with shrubs and trees requires more education than merely working on lawns, since there are more plants and pests to know. Roughly a $40 billion industry, ornamental shrub and tree services attract many firms to the field. The failure rate is high, though, and many companies don't survive the first few years. 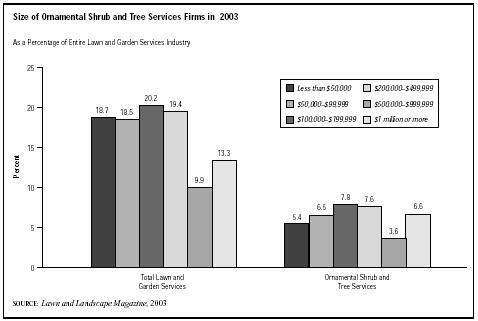 Tree and ornamental design products and services were the fourth-largest segment of the lawn and garden industry in 2003, accounting for 7.1 percent of industry revenues. Weather plays a big role in the industry. For example, along the mid-Atlantic area, hurricanes can actually be beneficial for shrub and tree firms, as the destruction opens an opportunity for re-landscaping. Strong housing starts are also advantageous for business. With the booming U.S. economy of the late 1990s, landscaping services of all kinds were in high demand. Labor shortages plagued the industry, with a better educated younger generation looking for white-collar opportunities. When the economy weakened in the early 2000s, the landscaping industry continued to thrive due to plunging interest rates, which reached their lowest point since the 1950s and bolstered real estate sales. to its business must invest at least six months into education. There are hundreds of shrub and tree types, not to mention pests and pest control. The commitment is costly in terms of time, and companies adding shrub and tree specialists need to be assured their investments will be worth the effort. The popularization of the gasoline-powered truck during the early 1900s made it possible for growers to easily transport trees and shrubs, prompting the development of a recognizable industry for ornamental plants. However, it was the rapid proliferation of suburbia during post-World War II economic and population growth that spawned a widespread demand for shrub and tree services. Growth in the number of installation and maintenance contracts for corporate campuses, residences, institutions, and other landscape markets bolstered industry growth throughout the mid-1900s. Strong housing starts, increased spending on homes by baby boomers, and a general trend toward more elaborate landscapes in both commercial and residential sectors aided many industry participants during the 1980s.When housing developments stalled and commercial construction markets collapsed in the late 1980s and early 1990s, however, many ornamental tree and shrub service companies suffered. Steady utility tree trimming markets and a revival in housing starts in 1992 and 1993 helped to buoy diminished earnings for some competitors. In addition, a string of natural disasters, including Hurricane Andrew in 1992 and the 1993 floods in the Midwest, hiked demand in some regions. Housing starts were increasing through the mid-1990s, and by March 1997, the rate of starts was approximately 1.4 million. This increase was encouraging news for the industry. In the mid-1990s, ornamental shrub and tree service companies tried to take advantage of a trend toward naturalized landscapes. Another growing segment of the industry was the relocation of mature trees from development sites to zoos, housing communities, or commercial properties. Companies also strived to invent advanced strains of shrubs and trees that would deliver improved performance and aesthetics. Utility line tree trimming companies grappled with increased community environmental sensitivity, which forced some companies to adopt low-impact trimming techniques. Many power companies simply suggest carefully planning the planting of trees and shrubs to avoid future problems with power lines—large trees should be at least 30 feet away from utility lines. From 1995 to 1996, landscaping tree shipments increased—an indication that the industry was doing well. In 1995, evergreen trees were most popular with 51.8 million units shipped; this increased to 60.2 million in 1996. Shade trees accounted for 37.5 million units in 1995 and increased to 46.6 million in 1996. Flowering trees accounted for approximately 27 million units in 1995, increasing to about 33 million in 1996. About 11 million fruit/nut trees were shipped in 1995; in 1996 about 13 million units were shipped. As the industry was evolving, more companies, such as Asplundh, were becoming concerned with regulations in order to comply with safety standards. Work crews and customers were often supplied with information on new regulations—including OSHA changes, ANSI standards, and state wage guidelines. With the economy booming in the late 1990s, both corporations and private homeowners were spending more on landscaping. The Christmas holiday was a busy time, with malls and office buildings often erecting large, living, Christmas tree displays. Some of these displays could cost up to $100,000. While the sluggish economy of the early 2000s put a damper on spending in most industries, the landscaping industry was protected by a growing number of housing starts, the result of record low interest rates. In 2003, a record 1.085 million homes were sold. However, the industry did feel the effects of rising healthcare costs, as well as increased fertilizer and fuel prices, all of which undercut profitability. In 2003 ornamental shrub and tree services accounted for 7.1 percent of the lawn and garden services sales, compared to 5.3 percent in 1998. This extremely fragmented industry is dominated by thousands of small, privately held companies making less than $1 million in annual revenues. In fact, the ornamental shrub and tree businesses garnering more than $1 million in sales in 2003 represented only half of the 13.3 percent of all lawn and garden services firms that reached this sales milestone in 2003. The ornamental shrub and tree businesses securing revenues between $100,000 and $499,999 made up roughly 15 percent of the 40 percent of lawn and garden service firms that filled this sales bracket. And those posting sales of less than $100,000 in 2003 accounted for 12 percent of the 37 percent of the lawn and garden service businesses constituting the lowest sales segment of the industry. The U.S. Department of Agriculture (USDA) defines environmental horticulture as trees, outdoor plants, bulb, turfgrass, and groundcovers, excluding bedding and garden plants. In 2003 the USDA reported that the environmental horticulture industry took in $13.8 billion—up from $13.7 billion in 2001. At the retail level, which includes delivery and landscaping services, environmental horticulture accounted for $136 per household in 2002, compared to $120 in 1998. Most of the companies in the ornamental tree and shrub industry are small, privately held firms. One leader is Asplundh Tree Expert Co. The company mainly trims trees for public utilities to clear lines. Asplundh reported 2002 sales of $1.68 billion and employed 27,978 people in the United States, Canada, New Zealand, and Australia. ValleyCrest Companies, formerly known as Environmental Industries, is a landscaping company that provides shrub and tree services; the company projected sales of $620 million in fiscal 2003. The company grows more than 2 million trees and has contracts for more than 6,000 gardens—both indoor and outdoor. The company has nearly 40 locations in seven states and 1,500 nursery acres in California. The labor shortage has been felt across the lawn and landscaping industry, even as unemployment began to rise in the United States in the early 2000s. Younger people, who typically fill the labor-intensive positions in the industry, are better educated than ever before and tend to have higher career aspirations. Government restrictions on the hiring of immigrants have hurt the pool of labor also. The biggest technological advance in the shrub and tree industry is microinjection. Microinjection allows for application of a pesticide in small, concentrated amounts under the bark of a tree. Contractors no longer need to worry about poisoning themselves or other people in the area. The technique saves time because the contractors don't need to notify neighbors, barricade the area, and don special equipment. The only drawback to microinjection is tree wounding, so contractors must take care how they inject the tree. Asplundh Homepage, 2004. Available from http://www.asplundh.com/index.html . "Floriculture and Environmental Horticulture-Summary." Economic Research Service, U.S. Department of Agriculture, 18 June 2003. Available from http://www.ers.usda.gov/publications/flo/jun03/flo2003s.txt . "Housing Dips, Economists Trip." Landscape Online, 2004. Available from http://www.landscapeonline.com/research/article.php?id=4060 .